Chanukah – The Festival of Lights. 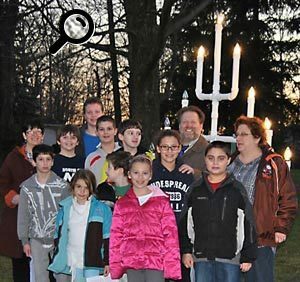 The Wednesday afternoon Hebrew school students sang the blessings on our front lawn and lit our Chanukiah. Celebrate Chanukah with Temple Israel Ner Tamid! This year’s Chanukah celebration service will be Friday, December 7th at 7:30 p.m. and will feature lots of latkes! Everyone come enjoy sufganiyot (jelly donuts), dreidels, songs and companionship. Last year we collected almost 100 children’s toys that were donated to Jewish Family Service Association of Cleveland for families in need. Let’s keep up the good work. Please bring a new unwrapped toy to this year’s holiday service. For the last several years we have had brought in Chinese food and watched a movie in the Temple on the 24th of December. Here are the prayers for lighting the Chanukah candles. Looking for the lyrics to the Latke Ditty? It is a congregational tradition to sing this song at services.